Kingdomino is a light game, all the players do is pick a total of twelve Dominoes-tiles with the two halves showing one of six different landscapes instead of numbers. 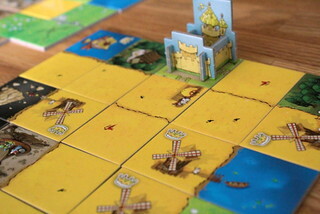 Those tiles, placed according to two simple rules, make up the player’s kingdom. 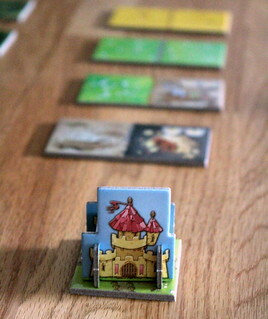 Rule one: one of the tiles two landscapes must border the same landscape or the starting tile with the player’s castle. Rule two: the kingdom mustn’t be larger than five squares in any direction. Near the end of the game you may have turns where you can’t play your tile according to those rules. That’s just personal misfortune when it happens, you don’t get a replacement. Some half-dominoes have one to three crowns in addition to their landscape. Those are good for fledgling kings, you want all the crowns you can get. But not just anywhere, crowns in the right place are the key. When the game ends, you count the squares in each connected area with the same landscape, and you multiply it by the number of crowns in that area. The result is the points you score for that area. So lots of crowns in a large area are what you really want, but the tiles you get and the placement rules are great at working against you. That’s nice and all, but not exactly special up to this point. But then you add the rules how tiles are picked into the mix. Each round, you have two rows of tiles. One one of them has the players’ meeple kings on them. From top to bottom each players takes the tile under his meeple king and places it in her kingdom. Then she places her meeple king on the tile that she wants from the second column. When all players did that, a new row of tiles is drawn from the back and the next round starts. Since player order is always from top to bottom, picking a tile also decides the player order for the next round. Wood for sheep? I got both! There is a catch of course: you sort the tiles by the number on their back, and that means the least valuable landscapes always go on top. Usually, that’s the wheat fields, because there are 26 squares of wheat fields. Only five of them have a crown, though, so scoring the big points with them is tough. On the other end of the spectrum you have the mountains. There are six squares with those in total, but only one of those doesn’t have crowns, and one is the only square with three crowns. Real nice to have, but picking mountains is almost certain to make you go last next round, and that means you’ll get the leftover tile no one wanted. Even worse, that tile might still be at the bottom of the turn order if no high value tiles were drawn this round. The connection between tile selection and turn order makes the game, really. 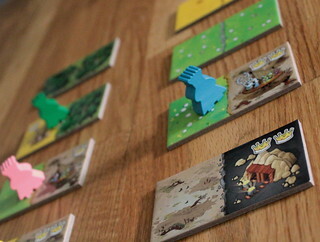 Without that, Kingdomino would be just another tile laying game, but connecting those two things adds tension to every decision. Do you go for the valuable tile at the bottom and risk being trapped as the last in turn order? Or do you keep going early and hope you can assemble a large wheat field that scores enough points to win. And you still get the good parts of a tile placement game. With short rounds and almost no downtime Kingdomino doesn’t get boring in a hurry, but if you do want a more challenging game there are some simple variants that spice it up. You can decide to score extra points for having the full five by five kingdom with no gaps, or for having your castle exactly in the center of your kingdom. Both sound simple, but it’s not always obvious if getting those bonus points is better or worse than placing a tile where you really want it. And for the two player game – which mostly works the same as playing with three or four, but each player has two meeple kings – there is a variant where you still use all the tiles and build an epic seven by seven kingdom. Kingdomino is a great family game. The rules are simple, the decisions are not, no one has a chance to get bored while waiting for their turn and, best of all, the balance between luck and strategy makes sure that younger players have a fair chance but adult players won’t get bored. A worthy nominee for the Spiel des Jahres.